A day after it was spotted on TENAA, Samsung has unveiled the all new Samsung Galaxy A70 phone in South Korea. It is the newest addition to the A series, the device features a triple camera along with a huge battery. It will be available in the following variants: Coral Blue, Black and White. Regarding the pre booking of the device, the company says that it will start from 10 April 2019. On 10 April, Samsung is hosting an event at three different places simultaneously. “Today’s consumers are using their phones in a more visually active and authentic way- sharing their experiences and staying connected longer. These connections can only thrive when most essential features allow people to enhance interactions through spontaneous, collaborative, and genuine connection. 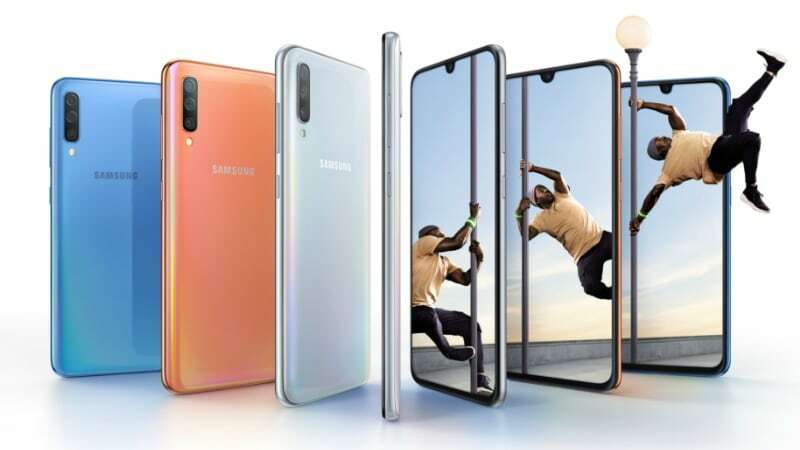 This requires an evolution, which is Why, to meet the needs of this emerging generation, we created the new Samsung Galaxy A70- designed for the way people are connecting now,” DJ Koh, President and CEO of IT & Mobile Communications division at Samsung Electronics, said in a statement. The Galaxy A70 features a 6.7 inch infinity-U display with a u-shaped notch. The full HD+ Super AMOLED display has got 1080 x 2400 pixel resolution. Samsung claims that the phone has got the biggest screen in the Galaxy A portfolio to date and the device provides a better, immersive edge-to-edge experience by offering a 20:9 aspect ratio. The handset has also got an on-screen display sensor. It is powered by Octa-Core processor (dual 2.0 GHz + Hexa 1.7 GHz), along with a good option to choose from 6 GB/ 8 GB RAM. The phone will ship with 128 GB internal storage that can be expanded upto 512 GB. The Galaxy A70 is powered with a massive 4500 mAH battery with a bundled 25 W adaptor for super-fast charging. The smartphone runs Samsung’s OneUI built on Android Pie 9. For the imaging, the Galaxy A70 comes with a triple camera system comprising of standard 32 MP sensor with the F1.7 aperture lens , an 8 MP depth sensor with F2.2 aperture lens. Samsung also claims that Galaxy A70 comes with a Scene Optimizer that can recognise and enhance upto 20 scenes. When it comes to security, the phone comes with Samsung Knox, its defence-grade security platform. As mentioned, the phone has an inbuilt-display fingerprint sensor and face recognition feature to unlock the phone. Other features include Samsung Pass, Samsung Health, Samsung pay and Bixby. The expected price of Samsung Galaxy A70 in India will be around Rs. 30,000.